I found this spider last month on our bathroom wall. I scooped him up and relocated him outside. I found your site days later, trying to find out what type of spider it is. I didn't think to take a pic of it at the time. A few nights later, I found another one on our blinds in our bedroom. First thought is he looks like a tiny crawfish or baby scorpion but definitely a spider, unless scorpions can spin webs. I did see a pic of a pseudo scorpion but this looks nothing like one as you can tell from my pics. It is only about 8mm long. 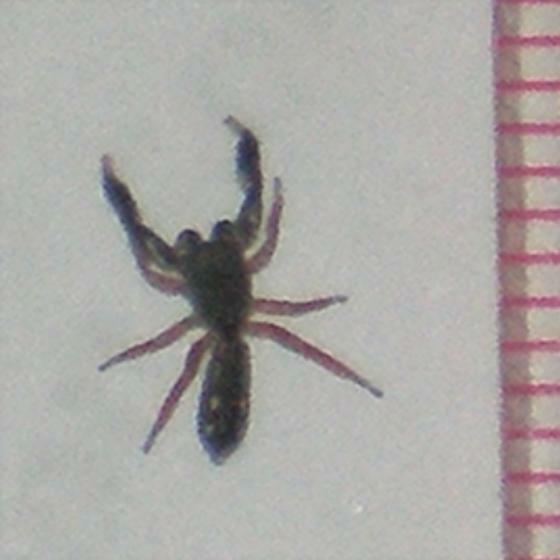 It has 6 predominant legs and 2 pincer like front legs and looks like stingers on the tips. It is a very cool looking spider and am curious what type it is. for Genus, but without higher-magnification photos it's hard to say on species. Possibly Hentzia palamarum; the males of that species also have large, dark front legs. They're quite common here in Oklahoma, which is fairly close to your location. This is some kind of jumping spider, and probably a male. The front legs are ornamented for use in courtship displays. The smaller appendages between them are "pedipalps," modified in males for the transfer of sperm to the female's genital opening. Totally harmless. Thanks Eric! I appreciate the quick response and identification.